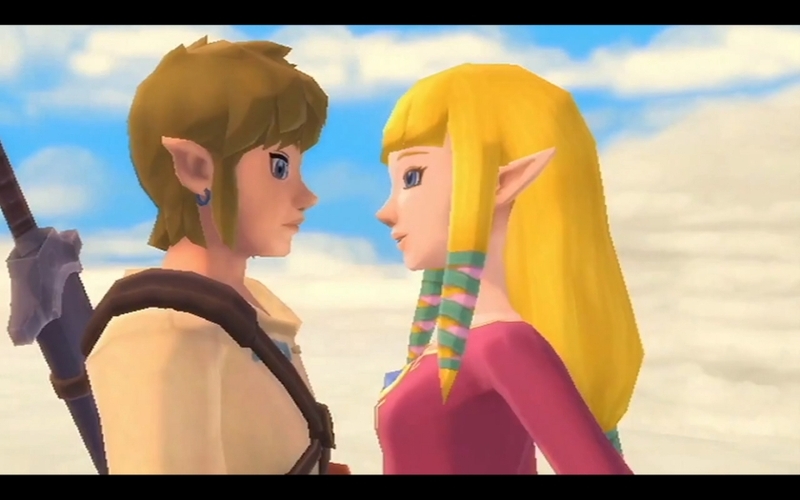 My favorite version of Link and Zelda is the pair from Skyward Sword. And it’s no great shock why that would be. In most versions of the story, Link and Zelda are practically strangers. They’re comrades, yes, but they don’t really have a personal relationship with each other. Twilight Princess features Zelda mostly as a background character, not really that important. Ocarina of Time gives her a bigger role, but she’s still not that personal with Link. Wind Waker is an exception to that general rule, and that one involves Tetra secretly being Zelda without even knowing it. In contrast, Skyward Sword features the original Link and Zelda, and they’re childhood friends. They’re also kind of sweethearts, or going in that general direction, at least. Either way, though, unlike any of the previous games, Link and Zelda have an actual relationship of some kind. So, this version of Link isn’t just serving his princess, he’s protecting his dearest friend. The love story that set the course of history for ages to come. I like the version in Phantom Hourglass when Zelda was just a tom-boyish pirate Tetra because we got to see her as a normal person with Link before she became a glorious princess.